In 1978, Some Girls proved that the Rolling Stones were still a major creative force and a rock and roll band to be reckoned with. In the age of punk, the Stones had proven themselves as fierce as any of the young upstarts who were dismissing them as dinosaurs. By ramping up the guitars, speeding up the tempos, and still being open to the current music scene, the Stones had planted a flag for all the remaining bands of the 1960s. In 1980, they dug up the flag and buried it under a landfill. Emotional Rescue is not the worst officially released Rolling Stones album, but it’s certainly near the bottom of the barrel. At least Their Satanic Majesties’ Request was an interesting failure and contained two classic Stones songs. By comparison, Emotional Rescue is a tired slog through the music scene of the day, populated by songs that were recorded but deemed not good enough for the previous album and a handful of new tracks. But even in 1980, the songs here sounded out of date. Disco was still king in 1980, but it was being absorbed by New Wave and post-punk and starting to manifest itself in some interesting ways. Some Girls showed that the Stones were paying close attention to disco and punk; Emotional Rescue indicates that they’d stopped listening to anything new in 1978. It is not the sound of a vital band; it is the sound of old war horses trying to emulate the sounds that the kids are listening to these days. The opening track, “Dance, Pt. 1”, is as imaginative as its title. It’s a disco/funk track that is better than “Hot Stuff” but nowhere near as good as “Miss You”. It’s actually a pretty good groove, and Mick Jagger is convincing even as the rest of the band is coasting. “Get up/get out/Into something new” Jagger snarls. The nights he was spending at Studio 54 are clearly his muse here, but the lyrics are mostly nonsensical; he seems to have put almost no effort into writing them. The Stones follow this with a rocker, opening the album with a disco/rock salvo that mirrors Some Girls. But “Summer Romance” is no “When The Whip Comes Down”. While “Romance” is one of the few genuine winners on the album, it’s also an archetypal post-Exile on Main Street rock track. It pales in comparison to the vastly superior rockers on Some Girls, but it’s a good album track here, and probably would have fit on Goats Head Soup or It’s Only Rock ‘n’ Roll. “Summer Romance” does, at least, have an excellent guitar solo, and Charlie Watts swings like a demon. There’s also an excellent bass line from Bill Wyman. In fact, Wyman is the unsung star of the album. For years his bass had been largely buried in the mix, but as the Stones paid homage to dance music, the rhythm section rose in importance and Wyman’s bass once again came forward. This album is actually a potent reminder of what a great bass player Bill Wyman was, and a sad reminder that the bass that was so prominent in the 1960s had become muted in the 1970s. “Send It To Me” served notice that the Stones were checking off boxes on this album. “Dance” was the disco track, “Romance” the rocker, and “Send It To Me” is the obligatory reggae filler. It’s a lazy shuffle that Charlie Watts sounds half asleep on. The entire band plays it as if they simply don’t care. Jagger tries to put some life into it, but his delivery is once again undercut by half-baked lyrics about a mail-order bride. The Stones were never particularly convincing when it came to reggae, and this is readily apparent here. There’s no inspiration at all, just lazy playing. The band returns to rock with “Let Me Go”, but the song simply sits there. Keith Richards and Ron Wood chug along nicely on guitar, but the song sounds like it’s going somewhere only when Jagger and Richards start harmonizing on the bridge. That moment passes in the blink of an eye and it’s back to the chug. There’s a decent guitar solo and once again Wyman plays like an old pro, but Watts now sounds like he’s completely asleep. The drums aren’t bad, especially in the breakdown about two and half minutes into the song, when Watts wakes up and reminds the world that he’s Charlie Watts and he doesn’t play bad drum parts, but nothing could save the song from its mediocrity. In the context of the album, “Let Me Go” sounds better than it actually is because it’s at the very least a rock number, and it’s the Stones playing the music they were born to play. It’s all the more disappointing because the song segues into “Indian Girl”, a too-long acoustic ballad that features some nice, tinkling piano parts and some genuinely lovely pedal steel from Ron Wood. But despite some interesting Mexican mariachi-style horns that add a nice touch “Indian Girl” is boring. The acoustic guitar is so laid back it might as well not even be there. Jagger talk-sings over the fade as the song disappears into nothingness. It’s too bad because on an album where the lyrics can best be described as weak, “Indian Girl” is a political rumination about the indigenous population of Central American countries at a time when that section of the world was being torn apart by conflict. It’s a serious subject and a heartfelt lyric, married to a tune that never happens. The second side of the album kicks off with another rocker. “Where The Boys Go” was picked up by rock radio at the time because it was one of the few songs on the album where the Stones rocked unapologetically. But that doesn’t mean it’s a good song. There’s a fine guitar solo, but Jagger sings much of the song in a faux-Cockney accent that is, at best, distracting and, at worst, silly. There are also prominent female backing singers that add nothing but stridency to an already half-assed vocal. Yes, it rocks. Yes, Charlie Watts is now fully awake and pounding. But “Where The Boys Go” is tuneless and pointless. Like “Let Me Go” it sounds better in context but this is the weaker song. The Stones had cut their teeth on blues music. Jagger famously said, in his first newspaper quote, “I hope they don’t think we’re a rock and roll outfit”. But while the blues always underpinned the Stones, the traditional form had largely been eschewed by the band. “Down In The Hole” was the first traditional 12-bar blues the Stones had done in many years. There’s a great harmonica and for the first time on this album the band sounds like they’re fully invested in the music. It’s not a great blues song by any stretch, but it was good enough that the Stones should have taken a cue from it and started doing more straight blues numbers. It’s a style the Stones always excelled at, and “Down In The Hole” provides a highlight on an album drowning in indifferent writing and playing. The Stones were smart enough to put only one real disco song on Some Girls, and “Miss You” had a bridge that came out of the rock world. While you could dance to “Beast Of Burden” it was disguised enough to pass for a rock ballad on first listen. But the title track for this album is the single purest expression of Jagger’s love of disco that the Stones ever did. It bears almost no trace of rock. There are good things here: as required by the Gods of Disco, the rhythm section is spot-on (Wyman’s bass is outstanding) and the song is an earworm, making it somewhat listenable even when you’re not on the dance floor. There’s also a great saxophone in the fadeout. But there’s plenty of bad here, too. Jagger sings the entire song in a tortured falsetto, and does a proto-rap that is nothing short of excruciating; Richards and Wood are almost invisible; there’s no warmth at all and nary a trace of emotion in the performance. “Emotional Rescue” is a time piece. It’s forever locked into 1980 and it must be admitted that it evokes a time and a place for those of us who were around at that time. As was true of most disco, however, the songs that worked when you were dancing do nothing when you’re sitting at home or driving in your car. That goes double for this song because its style was based on heavily electronic Euro-disco, and not the more organic American dance music. “Emotional Rescue” was shocking enough as a Stones song that many fans started reaching for the torches and pitchforks, but it’s not as terrible as it seemed when it first was released. It’s also not good. As if sensing that “Emotional Rescue” was a bridge too far, the Stones followed it with the one legit Stones classic on the album. “She’s So Cold” is the only track on this album that could have fit on Some Girls…probably because it was written and first recorded for that earlier album. Wyman again provides the support; his is the car the band rides in. Jagger’s vocal delivery is excellent and the lyrics contain the trademark misogyny and humor that marked so many of the band’s best songs. As they are throughout the album, the guitars are fairly muted but they are at least solid and Richards and Wood blend seamlessly. Unfortunately, the Stones couldn’t sustain this level even for one more song. “All About You” has some wonderful harmonies on the chorus, but this is the first of many of Keith’s sleepy, album-closing ballads. Keith hasn’t written and sung a great ballad with the Stones since “You Got The Silver” on Let It Bleed, and “All About You” is never more than pleasant and boring. Taken as a whole, Emotional Rescue is saved from being the Stones worst album by the fact that it sounds like the Stones at least had songs that they were performing (as opposed to the riff-based jams of Black And Blue). But there’s no question that the album is occasionally painful to listen to, and only once truly engages the listener. Satanic Majesties was a druggy experiment that went awry; Black and Blue was an audition turned into a contractual obligation album. Emotional Rescue was a different animal completely. 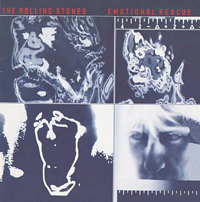 Emotional Rescue was the Stones doing what the Stones are supposed to do…and failing.